We are not huge snackers at our house but it seams that chips are one of the go-to items if someone wants a crunchy snack around here. My husband also brings his lunch to work everyday and usually makes a sandwich and what goes best with a sandwich? Some tasty chips!! But they cannot be just any chips, the crunchier the better we say :) That is what we like about the Hawaiian Brand Snacks, they have awesome flavors and the crunch factor is perfect! 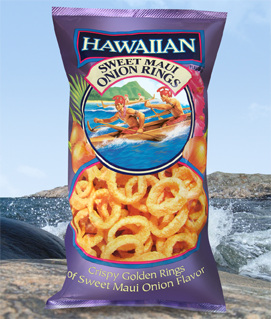 The hubby really likes the Sweet Maui Onion, me on the other hand, I am a Luau BBQ kind of gal. Oh man are they tasty...mmmm. If you and your family are looking for a crunchy snack that is packed full of flavor try Hawaiian Snacks Products, you won't be disappointed! 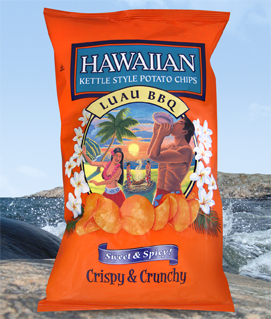 Win Hawaiian Brand Snack Chips for your family to snack on. 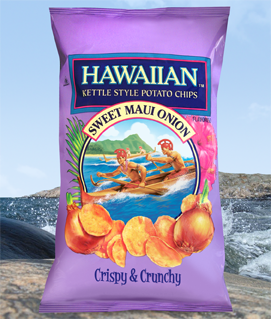 Which Hawaiian Brand flavor of snack would you like to try? *Limited to US residents; 18 years old and above. Giveaway starts March 7, 2012 and ends on March 14th, 2012 at midnight PST. Winner will be emailed and has 48 hours to respond before another winner is selected. I was not paid for this giveaway or post. The opinions on this item are 100% mine and may vary from others. The sponsor is responsible for providing the prize. I want to try the Luau BBQ flavor. I like Hawaiian Brand Snacks on fb under the name Et Pruitt.